Good’Ness what a time we had on vacation! This is our 4th or 5th year going back to Rehoboth Beach in DE. I cannot say enough about how much our family absolutely LOVES this place. We stay at a beautiful resort The Peninsula. It has everything under the sun, you will have to check it out for yourself. It is perfect for family’s but spares me the “honky tonk” that is Disney World. I know your saying “but Nick you seem like such a likable guy. How could you not love Disney World? Just ask anyone I know and they will share with you my sentiments on the subject. But enough about The Peninsula the real meat and potatoes of this story is about some of the glorious meals that we cooked. It was a perfect day on the water. We went fishing for Striper on the Indian River Bay. We caught small “spot” bait fish and then “live lined” them for Bluefish and Striper. This was Cole’s first experience on a fishing boat and he had an absolute blast! Fishing is something that my family always shared together and we all still enjoy it to this day. Being able to spend 4 or 5 hours out on the water with your family away from all the distractions is something that you just cannot replace. Now on to the meal. That night after a long day on the water we decided to pick up some blue claws. We rode around to a few different places that were absolutely out of their minds on pricing ($155 dollars for a half bushel or three dozen). On our way back we came across a gentleman (blue claw crab angel sent from heaven on a case of Miller Lite and some Newport’s) that was selling very lively blue claws out of his truck. In my estimation this has always been and will always be the only way to fly. Commercial seafood joints are pricing themselves out of the market. Why not buy direct from the source. Here is the deal though, you have to have lively crabs with good color, no smell and appear fresh. Pretty easy to judge with crabs, if they don’t look right don’t buy them. We scored 2 dozen for $20 and called it good. Old Bay BTW- old bay is my secret to everything, just an FYI. I could put old bay on my shoe and eat it. You need to have a steaming pot with an insert. 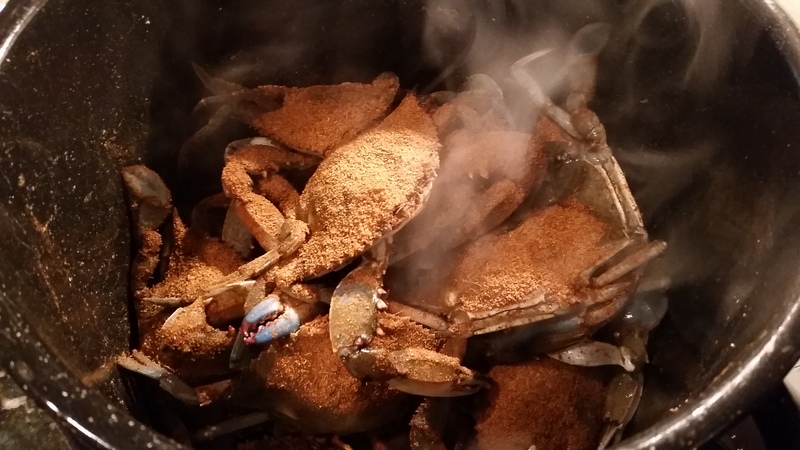 Bring the beer to a boil on the bottom, coat the crabs in the Mutha’ Fing Old Bay (be very generous). Cover the pot until the crabs turn bright red (15-20 min). Pull them out and lay them on some news paper to cool immediately. * If you try to keep them warm say in a cooler, the inside will liquefy* I had this happen once with some non- blue claw crab eatin’ donkeys that ruined an entire bushel. 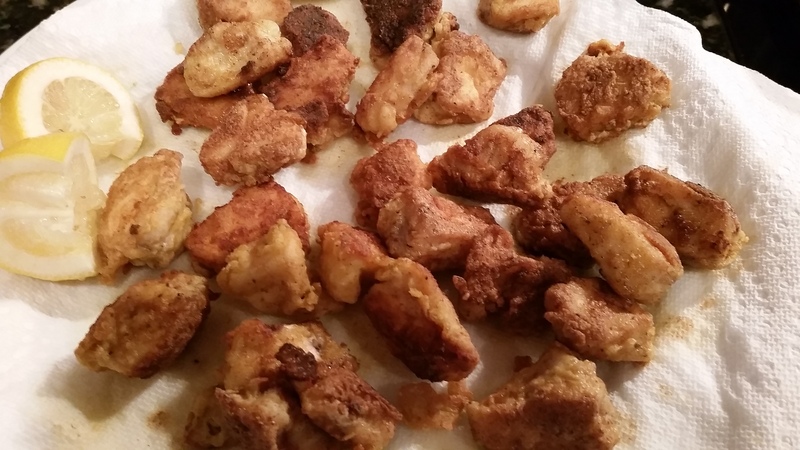 In addition to the crabs we had Striper Nuggets. 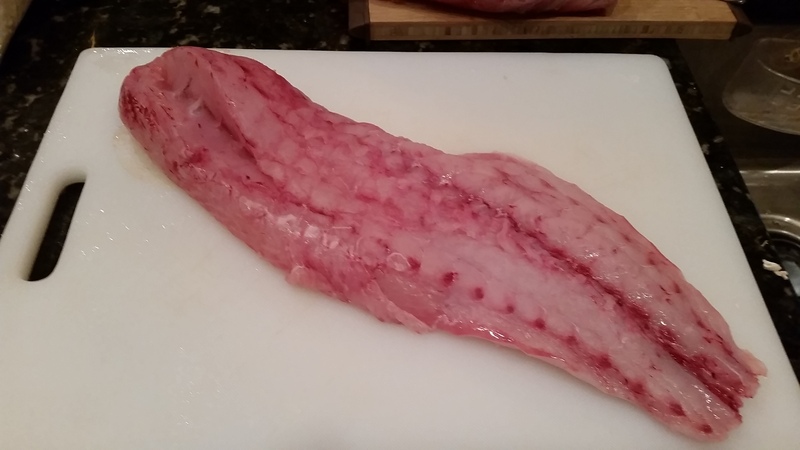 Striper is a delicious fleshy white fish that is absolutely gorgeous when cooked. I simply took the fillets and chunked them up into even bit size pieces. I then used some egg wash and breading to fry them in olive oil on medium heat. As you can see once the are golden brown and delicious looking they are done. Amanda also made a tarter sauce with spicy pickles that we brought from our garden. Look for her post coming up in the next week or so about our gardening experience this year! Needless to say the meal was slamming! More importantly, I got to relive one of my most favorite childhood memories which is eating crabs for hours with my Mom in Rehoboth. After a day on the water fishing with my family we would always go and have all you can eat crabs. That experience was always something that I have held close. Be prepared that when you have a conversation about eating blue crabsm, their are 2 very distinct camps. Those of us that know exactly what we are doing, and you people who have no idea what the hell you are doing. There are some very sharp lines drawn just a warning. Here is a video, that the guy does a nice job explaining how to eat crabs. 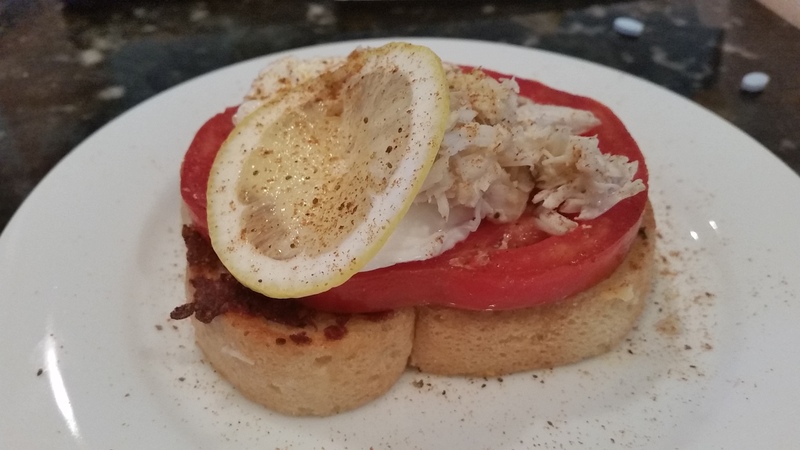 The next morning we had some left over crab meat so I decided that I would make “Crab Benedict” on Texas Toast with a slice of tomato and a very thinly sliced lemon. It turned out to be absolutely awesome. A perfectly poached egg nestled on top of a really thick piece of Texas Toast was nothing short of amazing. here is the recipe that inspired it. This one is not of crab, but the other stuff looks amazing as well! All in All we had a fabulous trip! I will write another blog about the night out that Amanda and I had at a slamming restaurant a(MUSE.). Where Chef Hari Cameron (@Hari_Cameron) is just nailing food left and right!